A good grip is fundamental to playing good golf, you can’t make a good swing with a bad grip. A lot has been written about the golf grip over the years, but the vast majority of amateur golfers get it wrong. As we’ll describe here, though, a great golf grip is simple to get right once you understand how the hands work in the golf swing. Your grip influences the club path, swing plane and club face position throughout the swing. It is also your only contact with the golf club, it provides the crucial sensory feedback that you need in order to move correctly and control the club, and it is the conduit through which the energy you generate in your swing is transferred to the golf club.you need to time your swing correctly. 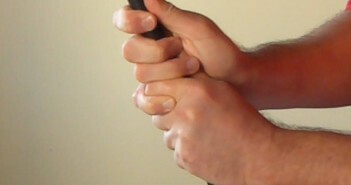 A bad grip will change your whole swing, from the moment you start to move. With an imperfect grip, you will need to introduce compensations into your swing just to be able to hit the ball, you won’t be able to transfer energy to the golf club efficiently, and you won’t receive the sensory feedback that you need to time your swing correctly. With a bad grip, a good swing will produce horrible results. The only way to achieve a reasonable outcome with a bad grip is through compensations — by making your swing worse! Once again, apologies to the lefties, for simplicity these instructions are given for a right-handed golfer. What Makes a Good Golf Grip? Be as natural (anatomically ideal) as possible, allowing your body to work efficiently and safely, avoiding undue stress on your joints. In short, the perfect grip will provide the best combination of stability, control, efficiency, and sensitivity. All of these things are necessary in order for you to strike the ball with power, accuracy and consistency. The final point, safety, should never be compromised. Your senses are highly tuned to change. Your grip is your connection with the golf club, it provides the majority of your sensory feedback during the swing, and when you change your grip then that feedback will feel different. When you are in the process of changing your grip, your swing will “feel off”, and you will struggle to stick with the changes. These changes in feel will cause you to tense up subconsciously, and tension is very bad for your golf swing. Also, you have learned to live with an imperfect grip. 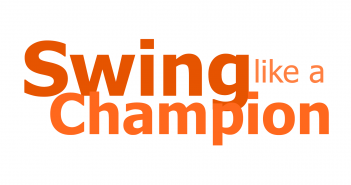 Your swing has a myriad of compensations ingrained into it. When you first change your grip, you will still have many of the compensations which don’t work with your new grip, and will now be ruining your swing. Unlearning these compensations will take time. As with most swing changes; for a while, at least, if it feels uncomfortable and unnatural then you’re probably doing something right. But ultimately, you must remember that you cannot play your best golf with an imperfect grip, so make the change, work through it and make it stick. The first thing that you need to do is to get comfortable with your new grip. 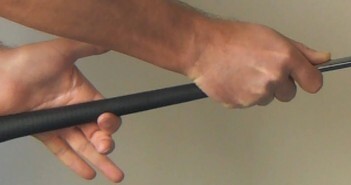 Keep a golf club to hand, and practise your grip as much as you can. Regularly check your grip carefully in the mirror and on video. Keep practising until it feels natural. With enough practice this will only take a few days until it feels comfortable, although fully ingraining and integrating your new grip into your golf swing is a 2 to 3 week process. Once it is correct, never let it change. 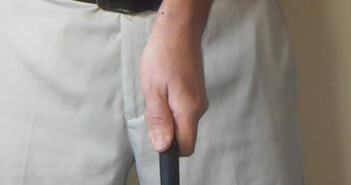 One of the problems with the golf grip is that you never know it’s wrong until you actively look for errors. When you make a bad swing you may think “I came over the top” or “I was too quick”, when in fact it could just be that your grip has changed slightly without you being aware. You will need to check your grip regularly, it’s easy for faults to creep in unnoticed, and these quickly lead to compensations and swing flaws. And if you try to fix those swing faults without fixing your grip, you will just be compounding the problem. Things can get pretty ugly, pretty quick! You will learn to use exactly the same grip for every full swing; for hitting the ball straight, a fade, a draw, high or low. Tinkering with your grip between shots will severely disrupt your proprioception, and it’s then incredibly difficult to recover during a round of golf. You should never have to think about your grip during the swing. When you take your stance, with your arms hanging relaxed in front of you, then, if you have good posture, your palms will face each other. If they don’t, go back and work on Golf Swing Drill 101 – Setup: Perfect Posture and Connecting to Your Core. You may have been told that you should try to maintain a completely flat left wrist, perhaps by putting a ruler under your watch strap. This is incorrect, and would give you a weak grip. When your wrists are relaxed, they will naturally be a little cupped (extended), and you want to maintain this cupping as you take your grip so that the hands can be placed naturally on the club. Your left arm will turn slightly as it moves across your body, and thus the cupping looks more pronounced. 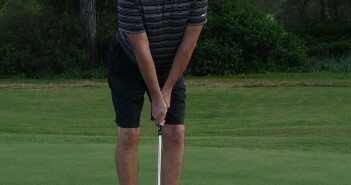 As mentioned in Golf Swing 103 – Setup: The Perfect Golf Spine Angle, there is a common golf instruction myth that tells you that your hands will turn in opposite directions, in towards your thighs, when your arms are relaxed and hanging under your shoulders naturally, and that, because of this, your grip should have the hands turned in a similar way — the right hand with a weaker grip, the left hand stronger, or alternatively that you should have both hands in a very strong grip position. If you have good posture, with your shoulder blades retracted and down, then your hands will not naturally turn in towards your thighs. Following this ignorant advice will lead to numerous swing faults and potential injury, as it places undue stress on your shoulders and right elbow. Okay, now let’s start putting together your perfect golf grip, starting with Golf Swing 104b – Setup: The Perfect Golf Grip – Your Left Hand is Your Control Hand.